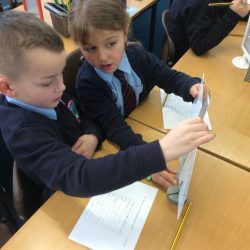 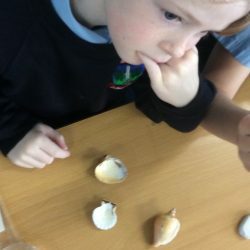 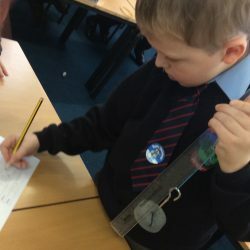 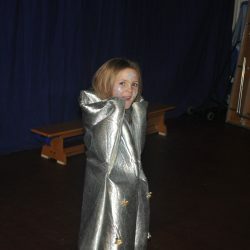 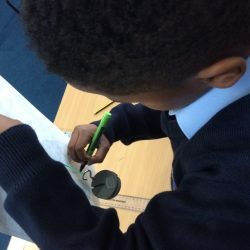 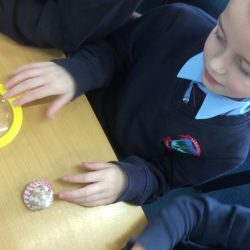 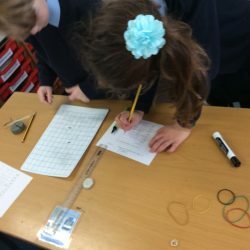 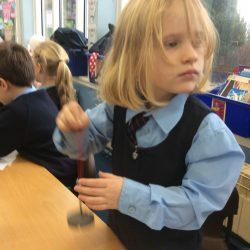 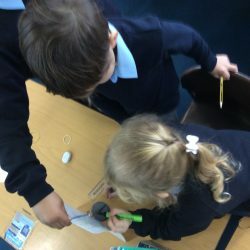 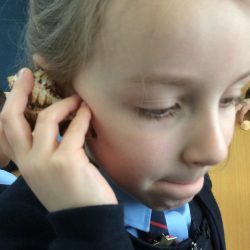 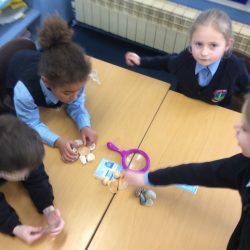 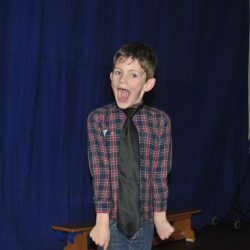 Year 2 have been exploring a whole range of senses as part of our Science Festival, and not just the usual five we think of. 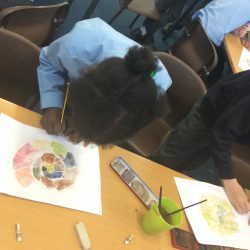 We explored how the smell and colour of food affects what we think it tastes like (yes, the green, orange and dark red drinks were ALL just lemonade) as well as how our sense of touch can tell different textures apart. 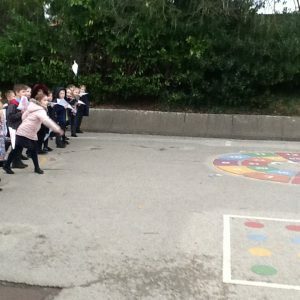 We also learnt about a sense called proprioception. 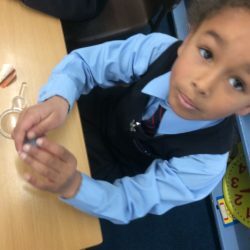 That’s the sense that lets you know the position of your body – try putting your finger to your nose with your eyes closed. 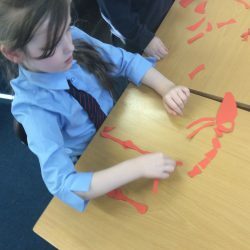 Sensors in your muscles and joints send information back to your brain. 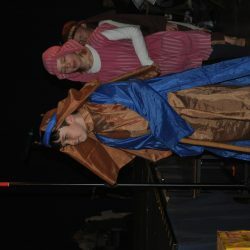 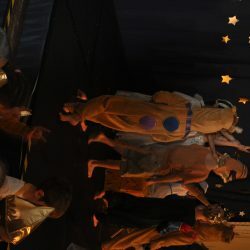 However, we discovered that it can be tricked by our other senses. 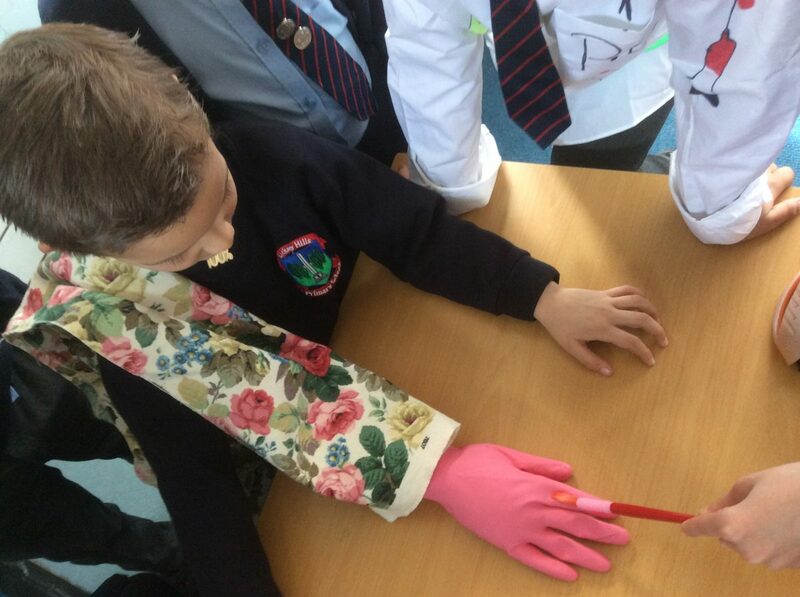 We even fooled our brains into thinking we had an extra hand! 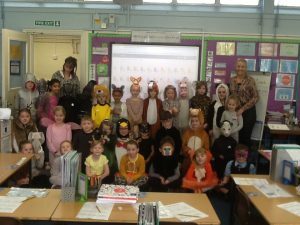 Happy World Book Day from 2AH! 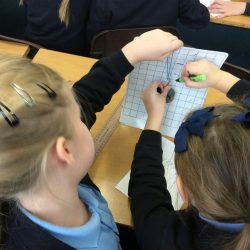 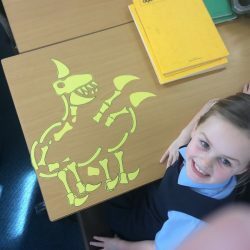 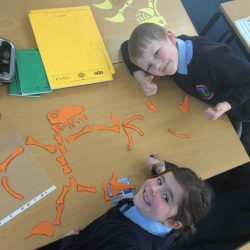 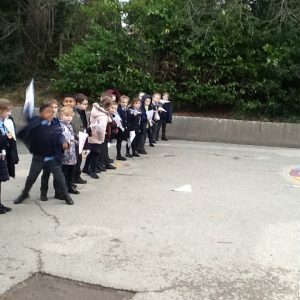 Year 2 and LB1 have been following the adventures of Charles Darwin on HMS Beagle. 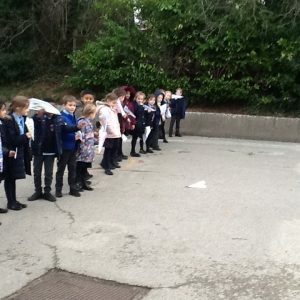 This week Mr Darwin experienced a volcanic eruption, an earthquake and a tidal wave (all a true story!) 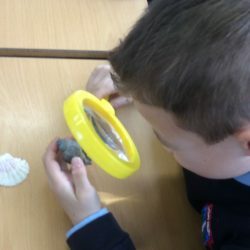 before venturing high up into the Andes Mountains where he discovered fossilised seashells. 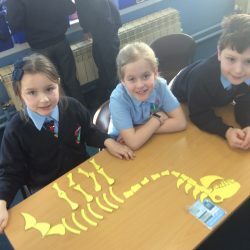 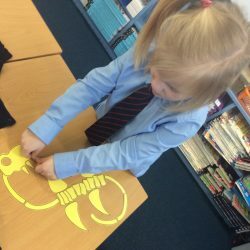 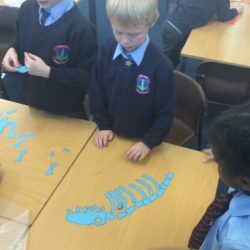 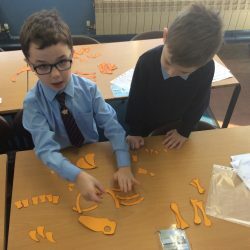 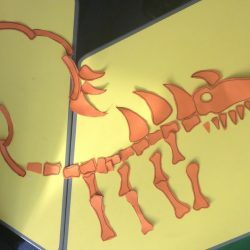 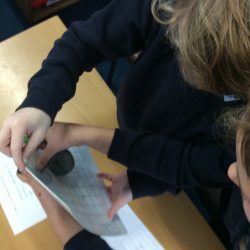 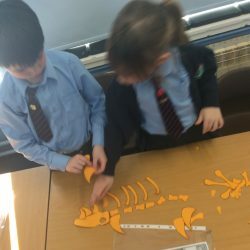 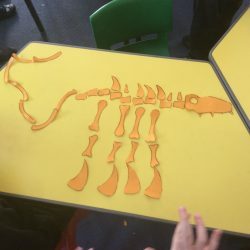 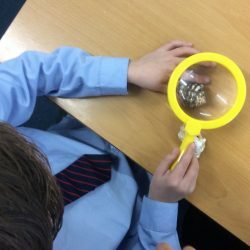 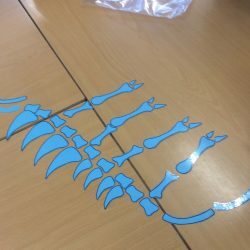 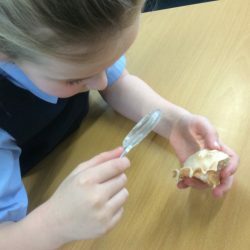 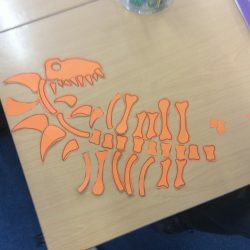 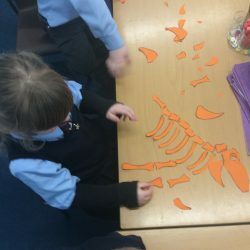 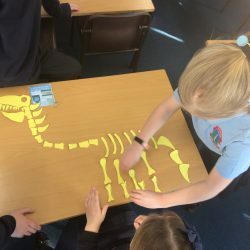 We then looked at some fossils, including ammonites, coral and seashells before having a go at trying to work out what a dinosaur may have looked like from just its bones. 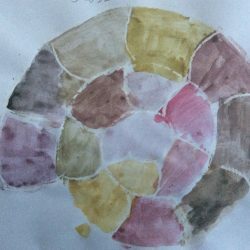 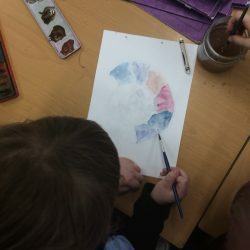 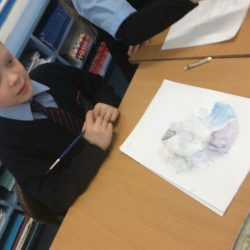 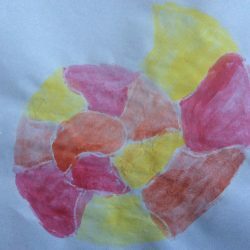 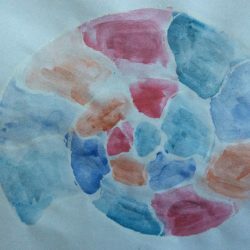 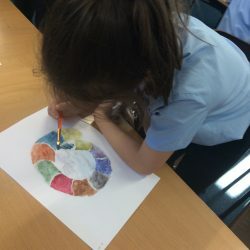 2MG also had time to produce some beautiful ammonite watercolour paintings. 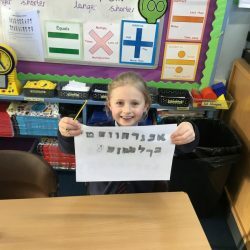 In RE today we really enjoyed exploring the Torah and learning how it is used and where it is kept. 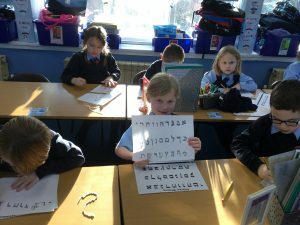 We noticed it was written in a different alphabet – Hebrew. 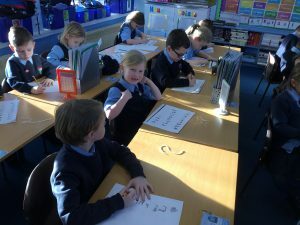 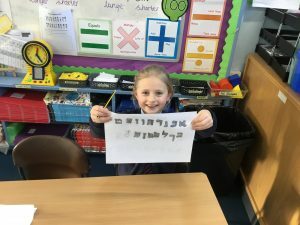 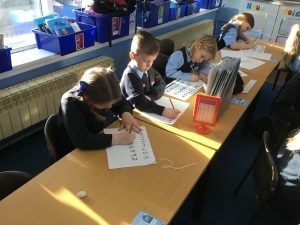 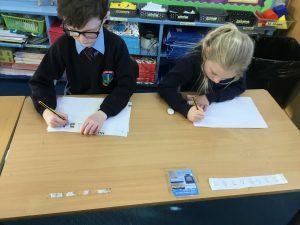 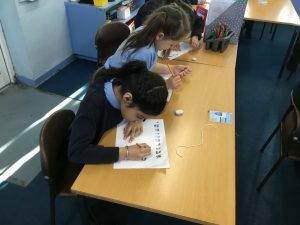 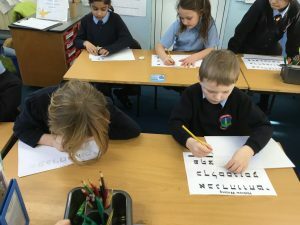 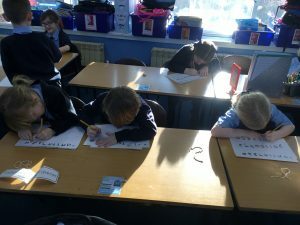 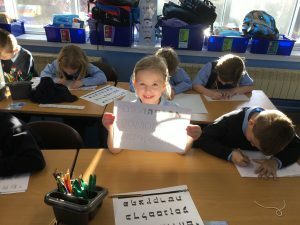 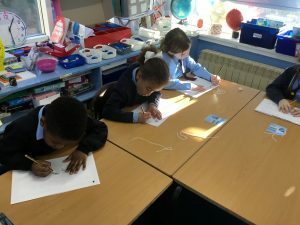 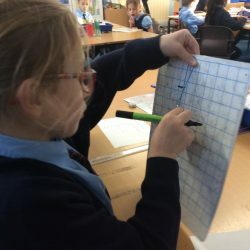 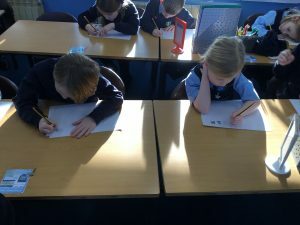 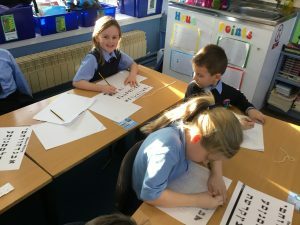 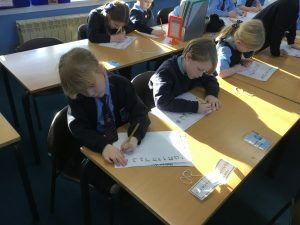 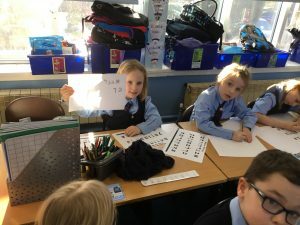 We then really enjoyed doing some of our own Hebrew writing starting from the right hand side of the page and writing the opposite way to how our alphabet is written! 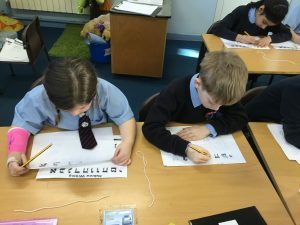 This term in science, Year 2 are joining Charles Darwin as he voyages around the world on the HMS Beagle exploring different habitats. 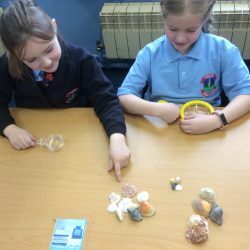 We’ve already found out about some of the plants and animals that live in the rainforest but this week we’ve been exploring rock pools on the Cape Verde islands. 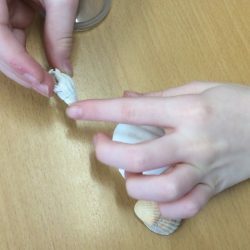 We looked at crabs, limpets and anemones before finding out about Darwin’s experience with a cuttlefish. 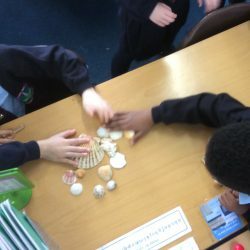 We then practiced our classifying skills by sorting and grouping shells by looking closely for similarities and differences. 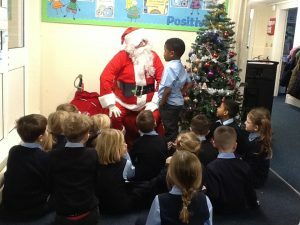 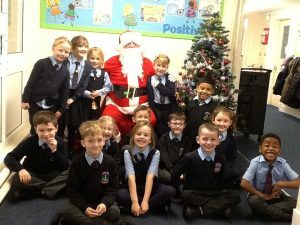 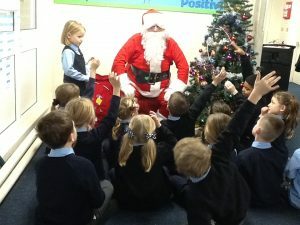 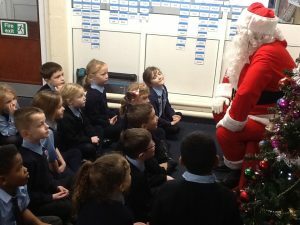 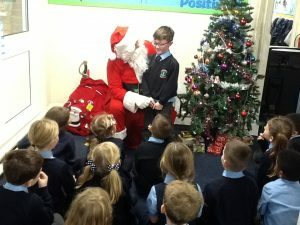 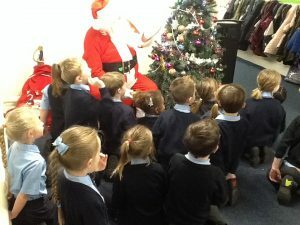 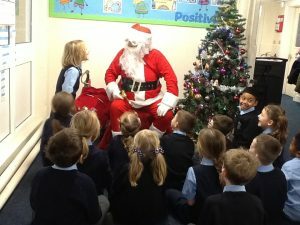 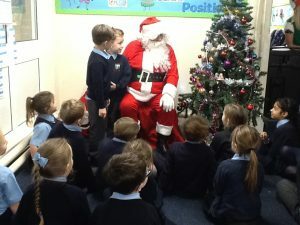 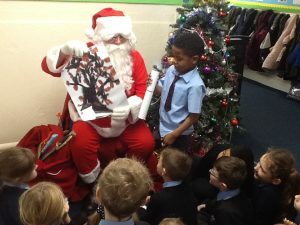 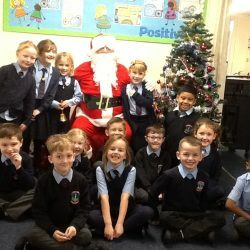 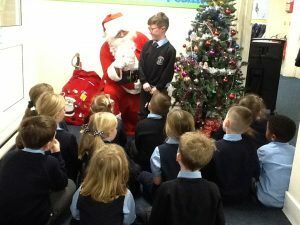 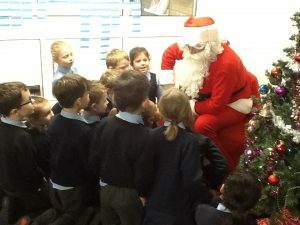 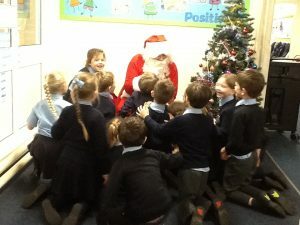 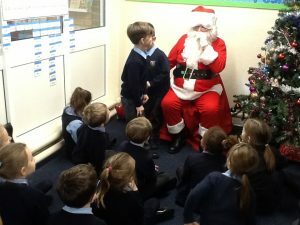 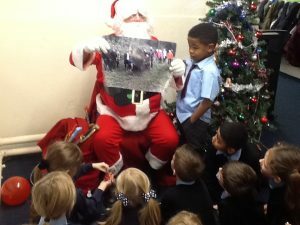 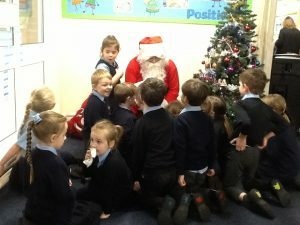 Today we had a visit from a very special visitor! 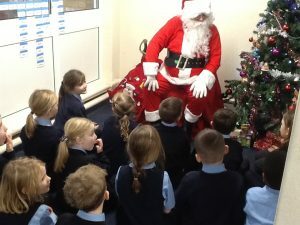 He told us we were all on the good list and he even gave us an early Christmas present! 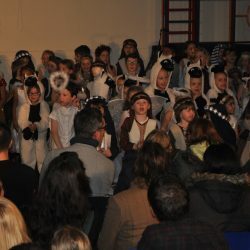 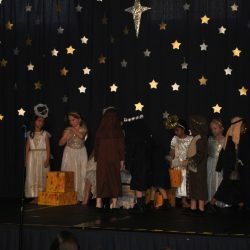 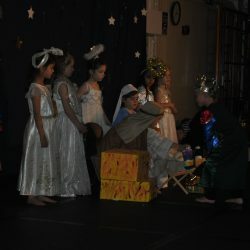 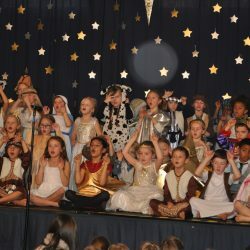 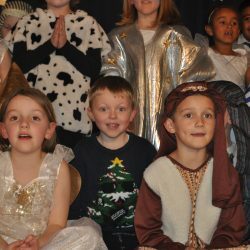 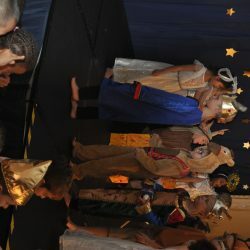 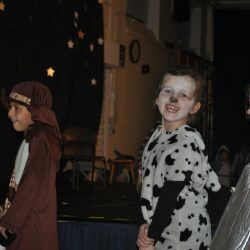 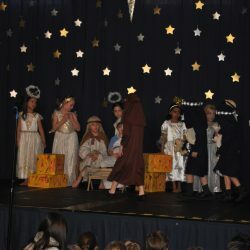 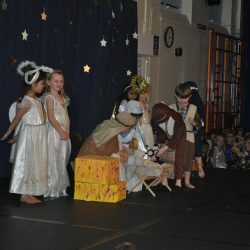 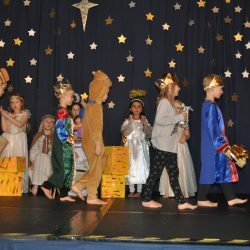 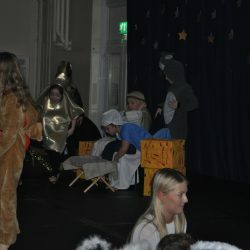 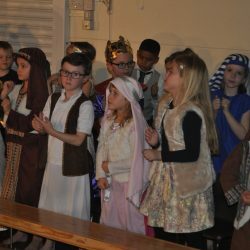 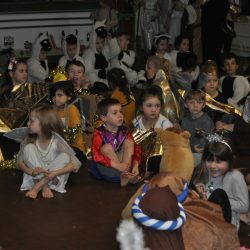 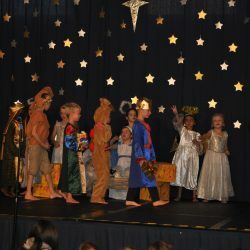 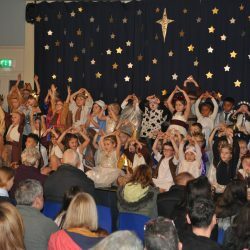 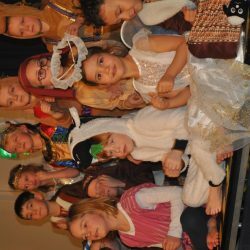 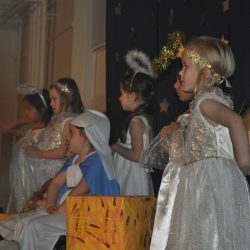 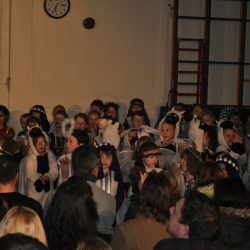 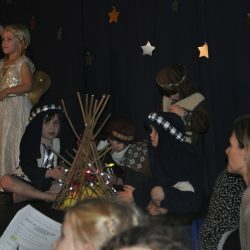 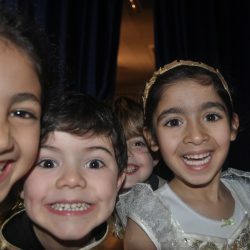 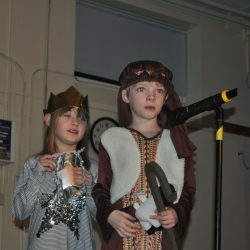 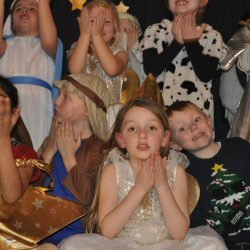 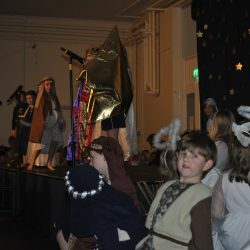 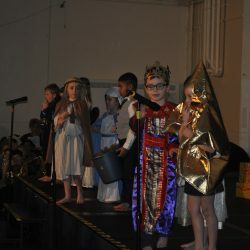 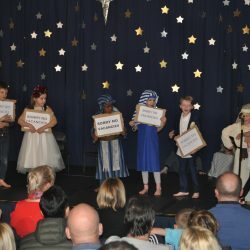 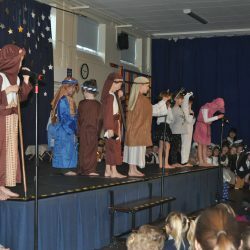 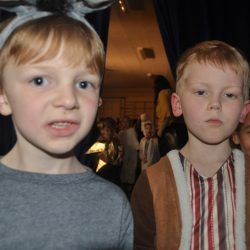 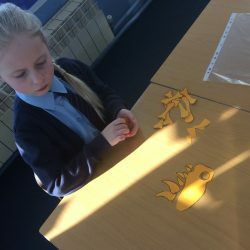 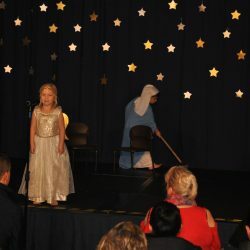 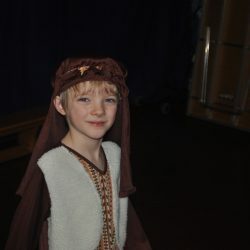 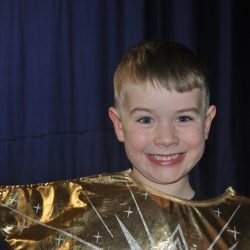 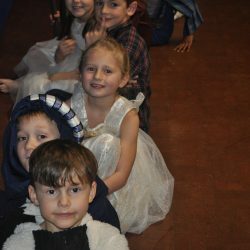 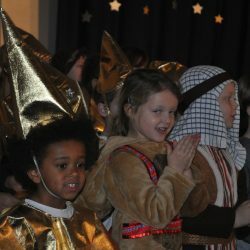 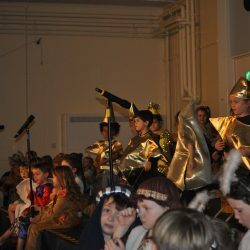 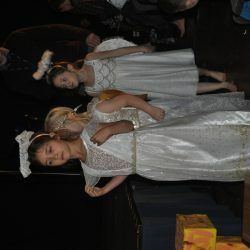 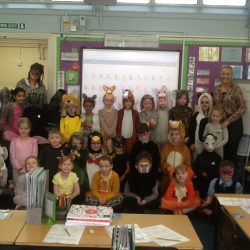 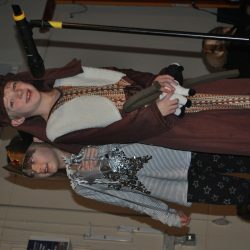 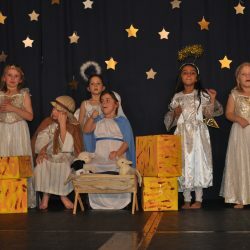 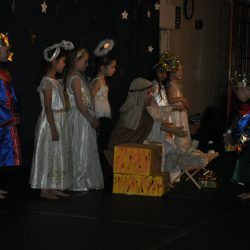 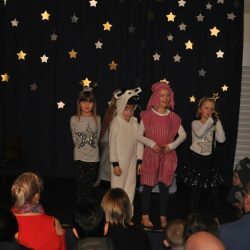 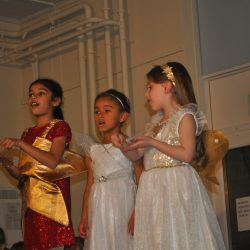 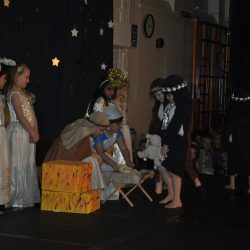 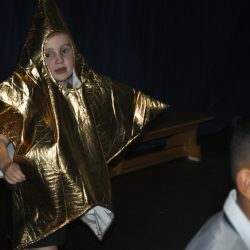 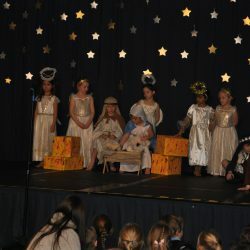 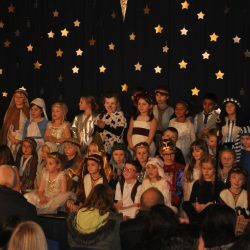 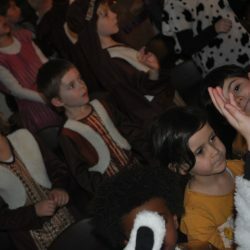 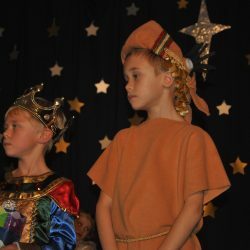 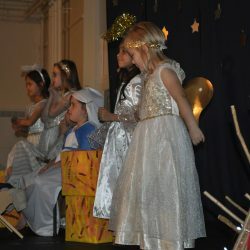 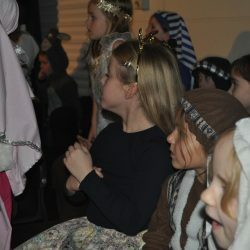 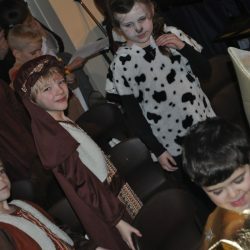 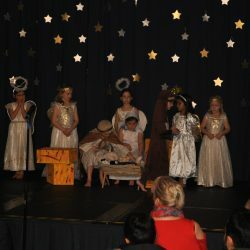 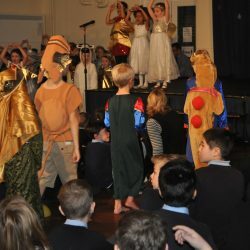 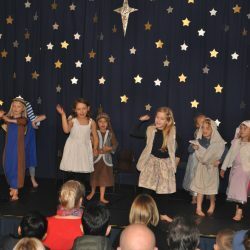 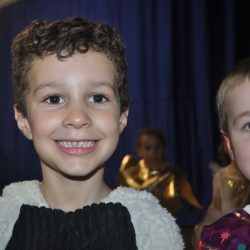 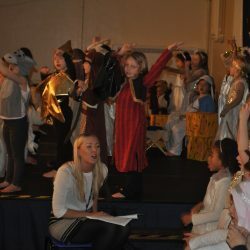 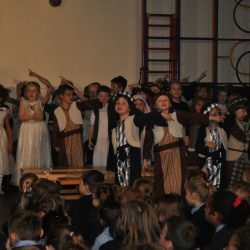 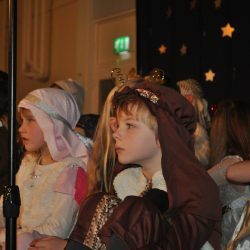 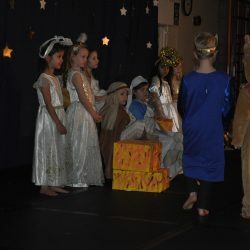 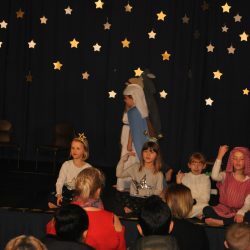 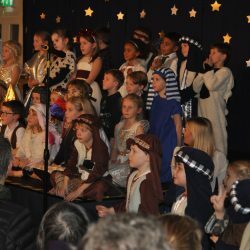 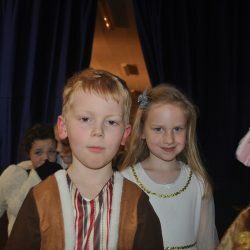 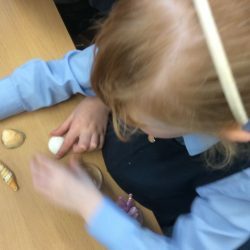 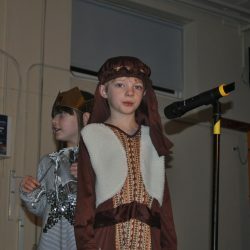 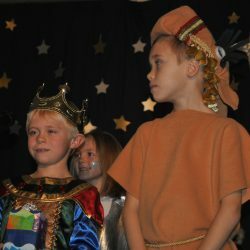 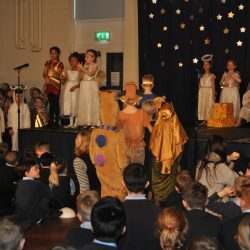 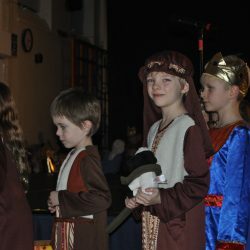 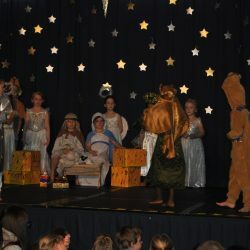 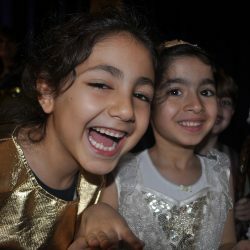 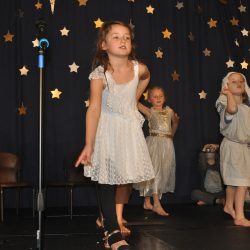 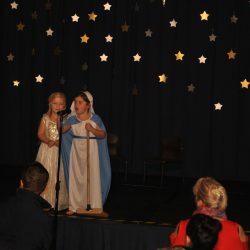 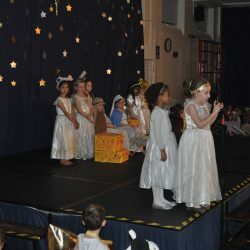 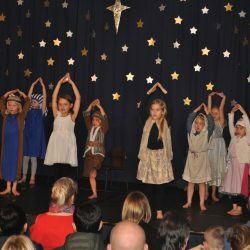 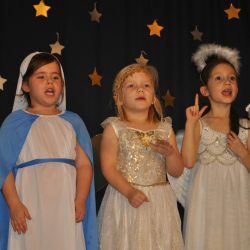 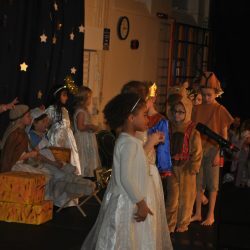 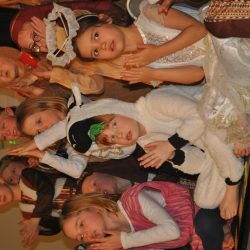 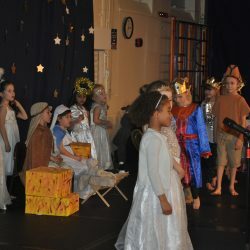 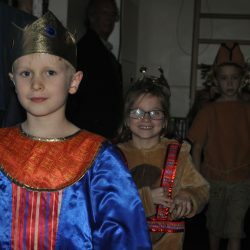 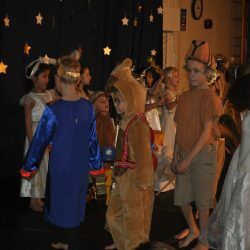 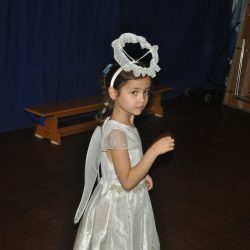 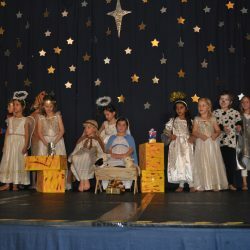 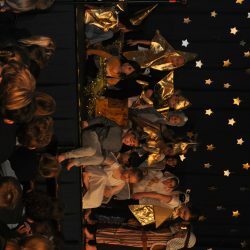 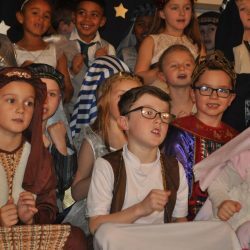 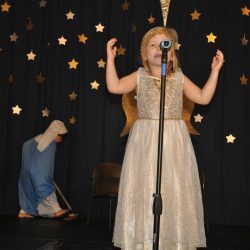 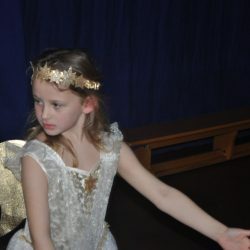 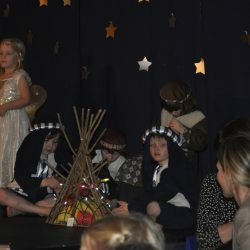 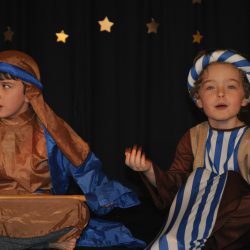 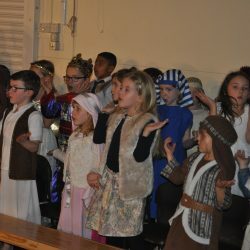 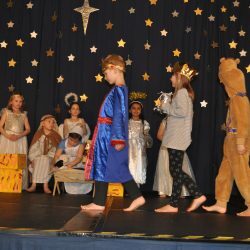 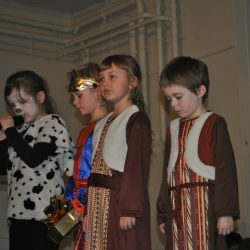 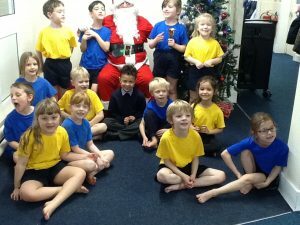 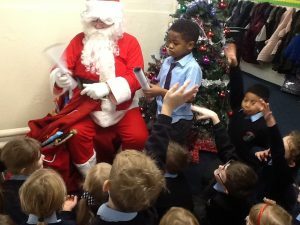 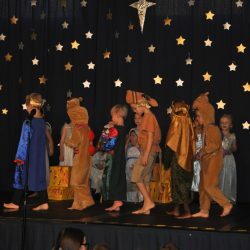 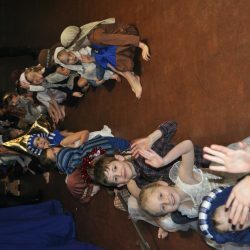 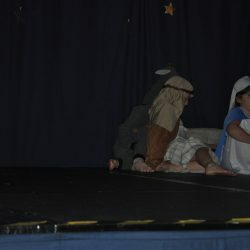 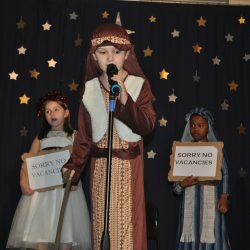 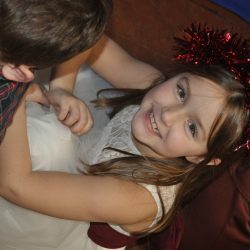 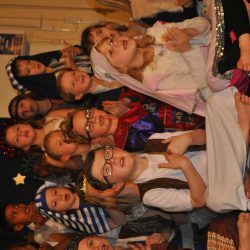 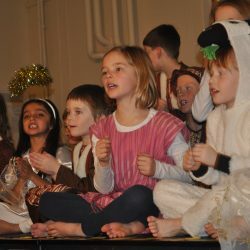 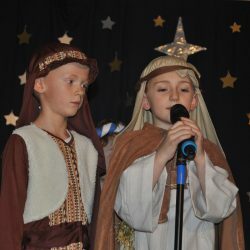 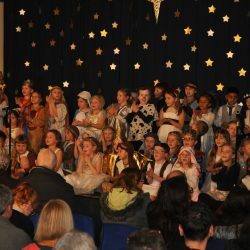 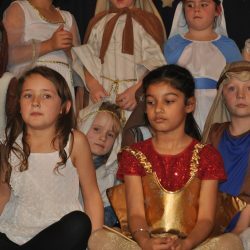 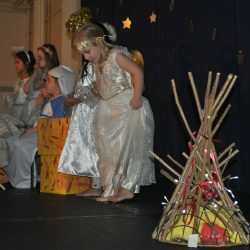 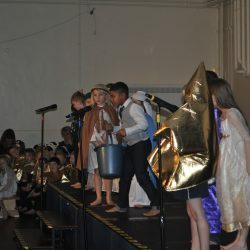 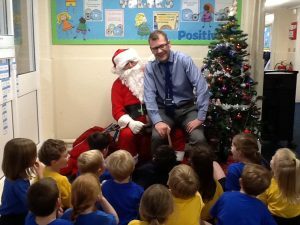 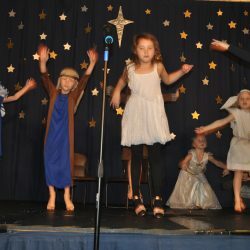 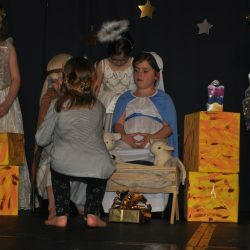 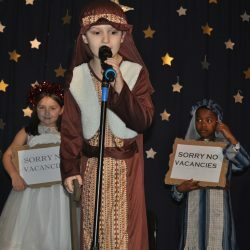 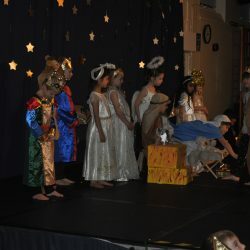 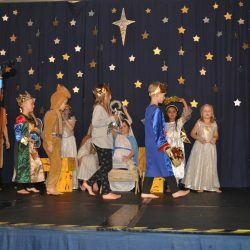 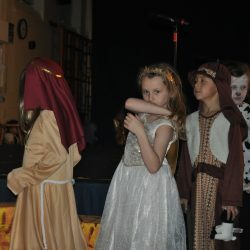 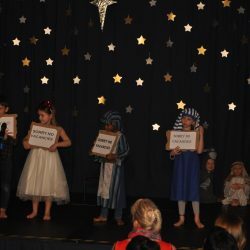 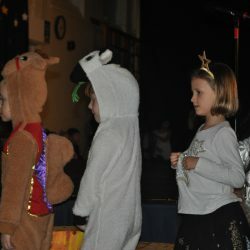 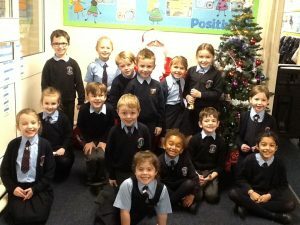 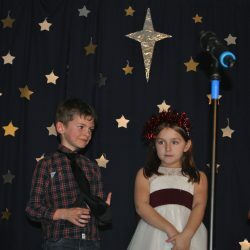 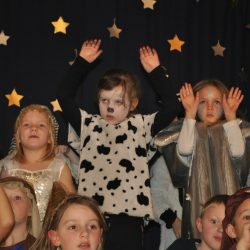 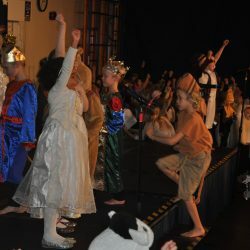 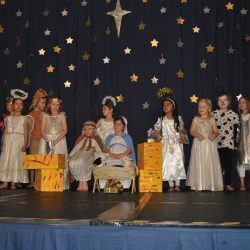 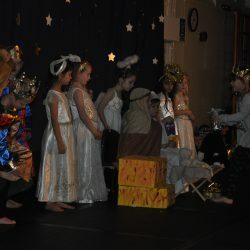 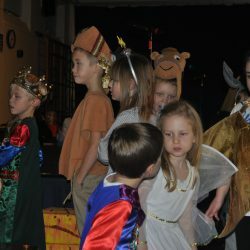 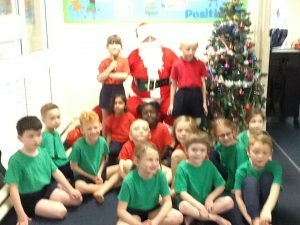 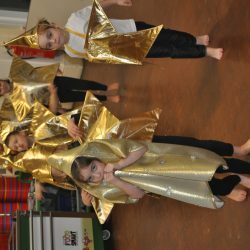 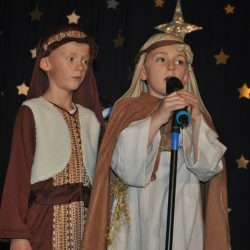 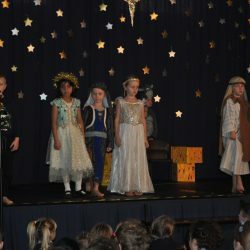 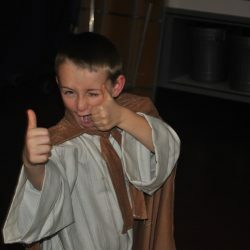 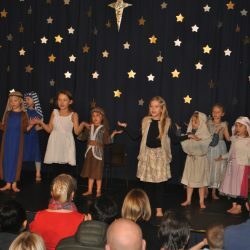 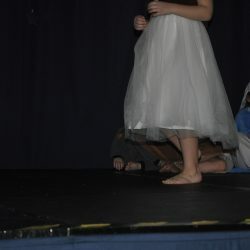 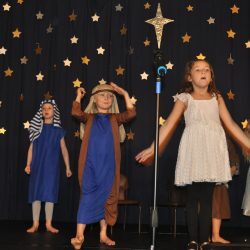 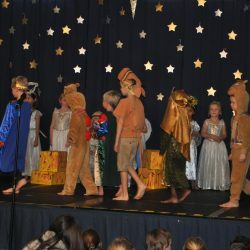 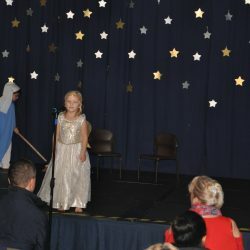 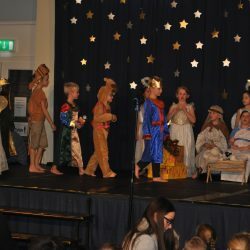 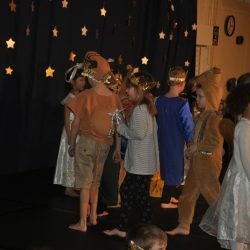 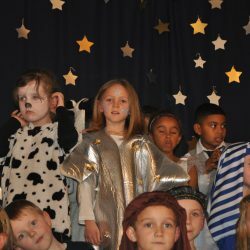 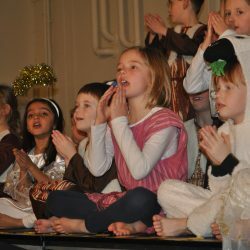 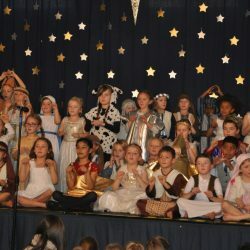 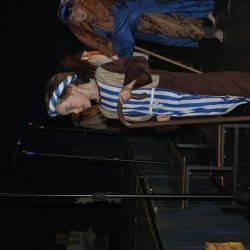 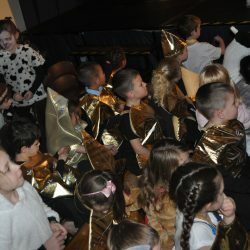 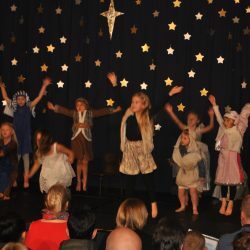 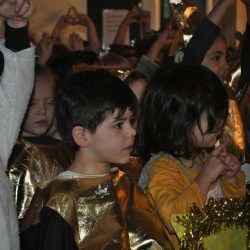 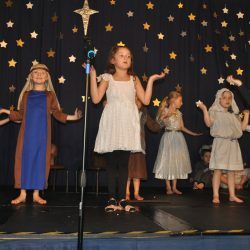 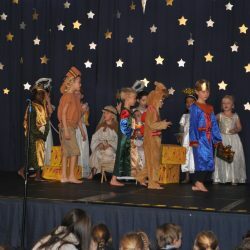 KS1 – It’s A Nativity! 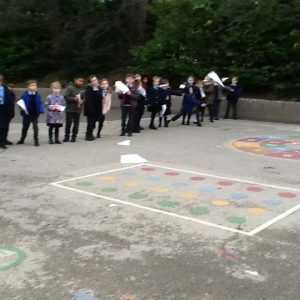 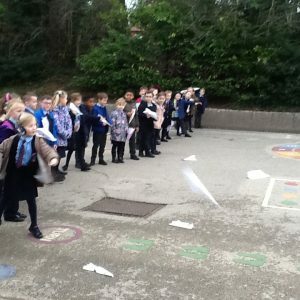 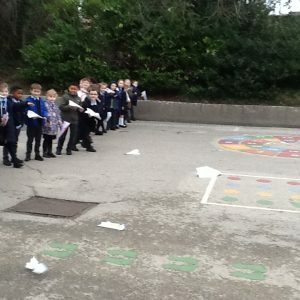 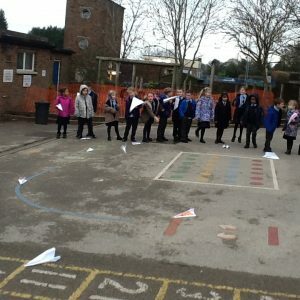 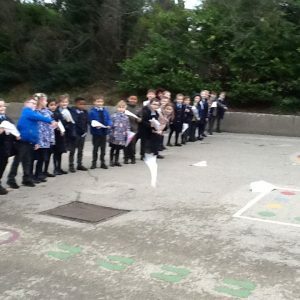 In Science today we made paper planes, experimenting with different materials to try to make ours go the furthest. 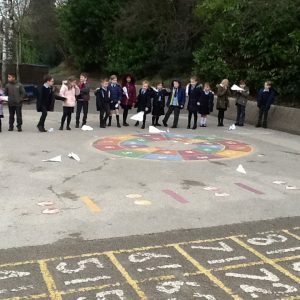 We had to think about the sort of paper we would use, the size of the paper and the design of the plane. 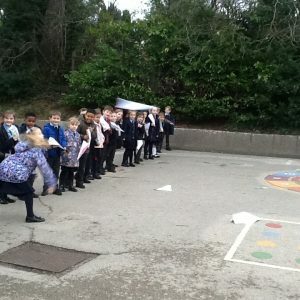 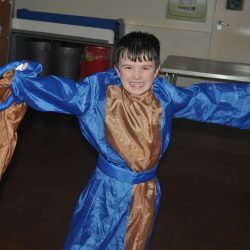 We then took it in turns to throw them on the playground – the furthest went 8 metres! 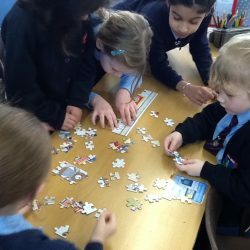 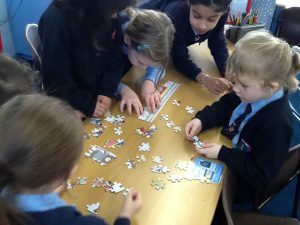 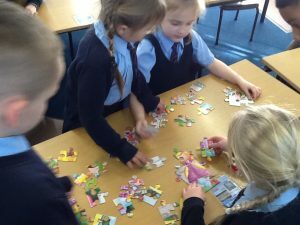 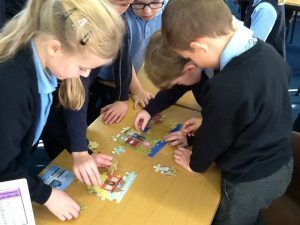 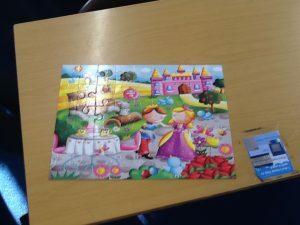 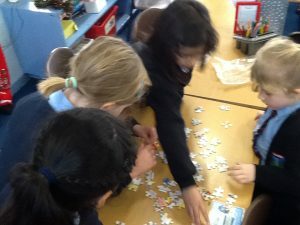 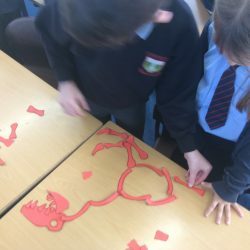 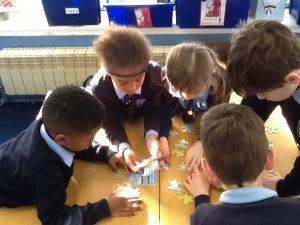 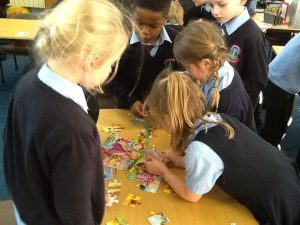 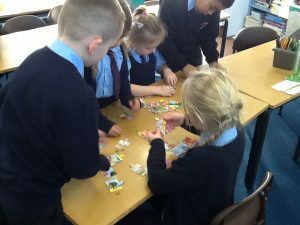 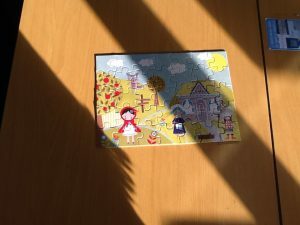 We had fun putting together jigsaws in PSHE today! 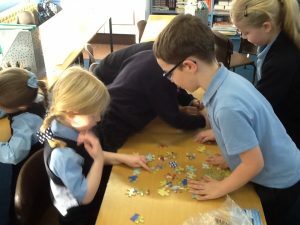 However, half way through some of us noticed we were missing a part and another group had it! 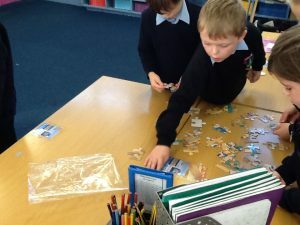 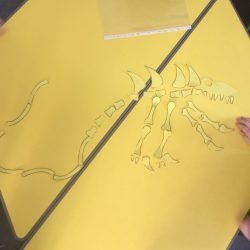 We were so good at using kind words asking the other groups if we could have our piece back. 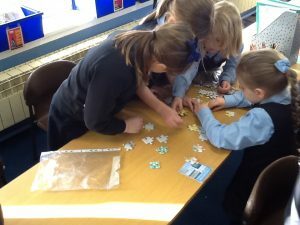 Amazing teamwork as usual 2AH!